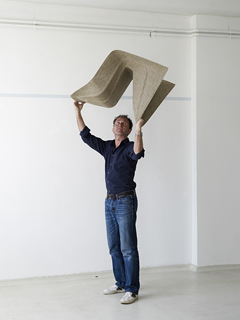 As part of the exhibition Poetry Happens in Ventura Lambrate 2014, Werner Aisslinger has shown the world’s first monobloc chair made of natural fibers, a project supported by the German chemical company BASF. 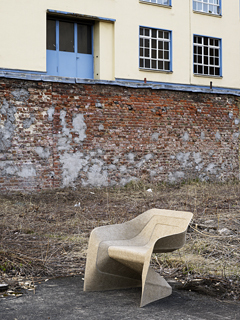 The „Hemp Chair“ has been designed for a lightweight manufacturing process stemming from the car industry: the renewable raw materials hemp and kenaf are compressed with a water-based thermoset binder Acrodur to form an eco-friendly, lightweight and yet strong composite. The sustainable sheet material of the Hemp Chair allows the use of more than 70% natural fibers in combination with BASF’s water-based acrylic resin Acrodur. Unlike with classic reactive resins, this method releases no organic substances such as phenol or formaldehyde during the cross-linking process. The only by-product of the curing procedure is water. Furthermore, the industrial process of compression molding accounts for low-cost mass production of three-dimensional objects with high mechanical resistance and very low specific weight. This production method is widespread in the automobile industry. Natural fiber composites are often used in lightweight components such as door linings, glove compartments or rear shelves. have often been made of reinforced plastics at the time they were launched. Shaping a complete chair structure from a thin layer of material is one of the most challenging ways to design and engineer a chair. 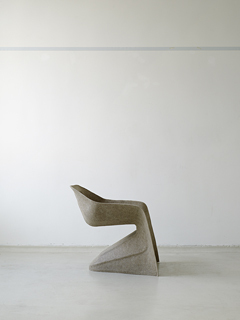 The Hemp Chair, with its soft curves and its bead structure, embodied a new approach to this complex type of chair. Werner Aisslinger delights in making use of the latest technologies and he has helped to introduce new materials and techniques to the world of product design such as his unique soft cell gel furniture collection and the Soft Chaise for Zanotta in 2000. The Juli chair for the Italian manufacturer Cappellini was the first piece of furniture made of polyurethane integral foam and became the first German chair design to be selected as a permanent exhibit at the MoMA in New York since 1964. In Milan in 2010, Werner Aisslinger presented his NETwork – 3D stitching furniture project with objects made by means of high-tech programming technology combined with traditional stitching techniques. His work is exhibited in the permanent collections of international museums such as the Museum of Modern Art (MoMA) and the Metropolitan Museum in New York, the French Fonds national d´art contemporain in Paris, the Neue Sammlung Museum in Munich, and the Vitra Design Museum in Weil am Rhein, Germany.